“We will win the World Cup in 1966,” famously declared England manager Alf Ramsey. Not everyone believed him, despite England seldom losing after he took over in 1963. But a good run of friendly results prior to the finals and rigorous training meant England were arguably better prepared than ever for a major tournament, while also having the advantage of being hosts. After a long wait, England could now look forward to group stage matches at Wembley against Uruguay, Mexico and France. 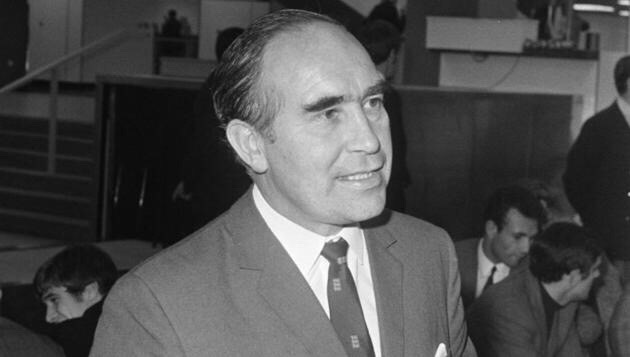 Alf Ramsey was adamant England could win the World Cup in 1966. By today’s standards, newspaper coverage on the morning of the game seems low-key for the start of the World Cup. The Daily Mirror did though include a four-page supplement, with sports writer Frank McGhee echoing Ramsey as he declared England would win the World Cup in 1966 – interestingly predicting they would beat West Germany in the final. But not all the experts were so confident Ramsey’s men would emerge triumphant. In The Times, ‘Football Association Correspondent’ (Geoffrey Green) wrote: “England will never hold a better chance. Yet England, I suspect, will go no farther than the semi-finals. If achieved, that at least would be their best performance ever in the cup.” Green fancied Italy to win the tournament. England’s line-up against Uruguay on July 11 has a familiar look, but a couple of significant absentees from the side that would win the World Cup 19 days later. It read: Gordon Banks, George Cohen, Ray Wilson, Nobby Stiles, Jack Charlton, Bobby Moore, Alan Ball, Bobby Charlton, Jimmy Greaves, Roger Hunt and John Connelly. The presence of Connelly meant England had a natural winger in the side – the ‘Wingless Wonders’ reputation was still to come. It’s perhaps interesting to note the two players who would go on to score for England in the final were watching on – Geoff Hurst and Martin Peters, both having only won their first cap in recent months. Prior to the match, The Queen declared the tournament open during an opening ceremony that would be deemed basic today. The stadium was not full, with the stayaways hardly left regretting their decision given the dull spectacle the sides served up. England began the World Cup with a frustrating 0-0 draw with Uruguay. There was frustration at England failing to win or score in their opening game at the time, so one can imagine the over the top reaction we’d get in the modern world with #RamseyOut trending on Twitter and hours of inquests conducted in the media. A visit for the squad to Pinewood Studios would provide a welcome diversion as attention now turned to England’s second match against Mexico five days later. The Mexicans were considered the weakest side in the group and five years earlier had been thrashed 8-0 by England. But in their opening match they had drawn with France and there was a danger England would again struggle to break their opponents down in this Saturday night Wembley clash. Ramsey selected Terry Paine in place of Connelly as the side again operated with a winger, while Peters came in for Ball. Bobby Charlton scored a stunning goal to break the deadlock, with Hunt wrapping up a 2-0 victory. Charlton’s goal had kickstarted England’s campaign. They hadn’t excelled, but they had achieved the win they needed. Bobby Charlton sets England on their way with his long-range goal against Mexico. It was only the fourth time England had won a World Cup finals match, despite having played at each tournament since 1950. In The Times Green wrote about England: “If their technique and imagination is limited, their morale and fitness are certainly at a peak.” Green would state that after one week “no one team towers head and shoulders above the field” in the competition, a situation perhaps similar to what we saw 50 years later at Euro 2016. If ever England were to go on and win a major tournament, then the 1966 World Cup on home soil appeared the ideal chance. The result left England on course to qualify for the next round, although they could still be eliminated if beaten by France. 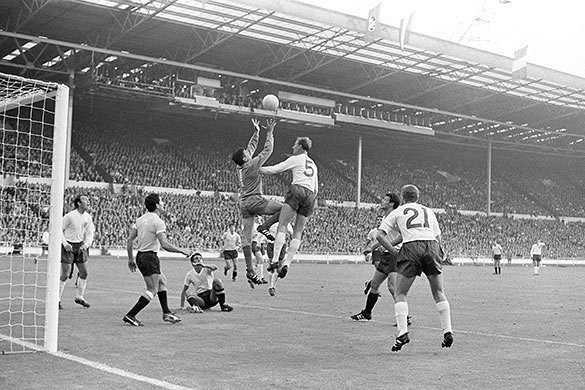 Uruguay had beaten France 2-1 at White City and then drew with Mexico, meaning a draw or win against the French would see England top the group and stay at Wembley. With Paine having sustained concussion against Mexico, Ian Callaghan came into the side against France as yet another change was made on the wing. Hunt celebrated his birthday by scoring from close range after Jack Charlton hit the woodwork shortly before half-time, wrapping it up 14 minutes from the end following an assist by Liverpool team-mate Callaghan (who was rewarded by not being capped again until 1977). Ramsey’s first match as England manager in 1963 had ended in a 5-2 defeat by France, so this was welcome revenge and a sign of the progress made in the past three years. The French were departing as the bottom side in the group. Roger Hunt opens the scoring for England against France. But England’s 2-0 win was overshadowed by an incident in the build-up to the second goaL Jacques Simon was on the receiving end of a harsh tackle from Stiles, which led to the Frenchman having to leave the field. The foul went unpunished at the time, but Stiles would be cautioned retrospectively and warned about his future conduct. Despite pressure from sections of the Football Association, Ramsey stood by Stiles. “Alf told them he’d resign if he couldn’t pick who he wanted,” Stiles said in 2002. “He was prepared to resign in the middle of a World Cup over me. I’d never found out that ’til he’d died, Alf. What a man.” Simon was not the only player to sustain an injury during the match, as Greaves found blood pouring from his sock and he would need stitches on his shin. He would miss the next match and, as it turned out, the rest of the tournament. England were into the last eight and two of the pre-tournament favourites were not, with Italy and holders Brazil on their way home. England’s quarter-final would be against Argentina at Wembley, with the South Americans having finished behind West Germany in Group Two. Hurst came in for Greaves, while Ball – who had feared he would play no further part in the tournament – returned in place of Callaghan. England were without a recognised winger and they would not be using one again in the finals. Unlike their South American neighbours Brazil and Uruguay, Argentina had yet to lift the World Cup. They would believe they had a chance of finally winning it provided they could eliminate the hosts. 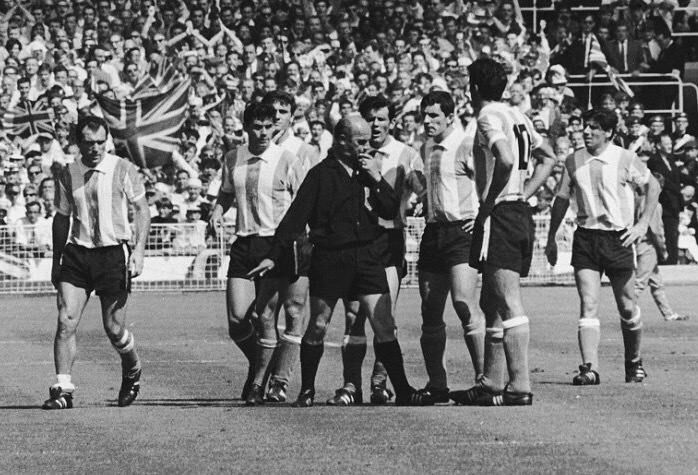 Chaos as Antonio Rattin is ordered off during England’s win over Argentina. As with when the sides met in the knockout stages of the World Cup in 1986 and 1998, there would be plenty of controversy and lasting memories from a contest that really ignited a rivalry between England and Argentina. It was certainly not a contest for the faint-hearted. Speaking in 2006, Jimmy Armfield – who watched the match as a non-playing squad member, said: “They’re like the little boy in the story book, Argentina. When they’re good, they are very, very good. When they’re bad, they’re horrible.” Cohen would later admit: “If they hadn’t resorted to all the physical stuff they might well have beaten us.” There was a feeling Argentina took an unnecessary over-physical approach when they potentially had the ability to compete football-wise with the hosts. In the closing stages Hurst justified his selection with a deft header from an excellent Peters cross – straight from the West Ham United training ground – to give England victory, although Argentina would claim the goal was offside as they cursed decisions made by the officials. England had triumphed on a brutal afternoon in the Wembley sunshine – one in which they were not innocent in proceedings, committing more fouls than their much-criticised opponents. But Ramsey was clearly unhappy with the conduct of the South Americans, infamously preventing George Cohen from swapping shirts with an opponent while already midway through the act. 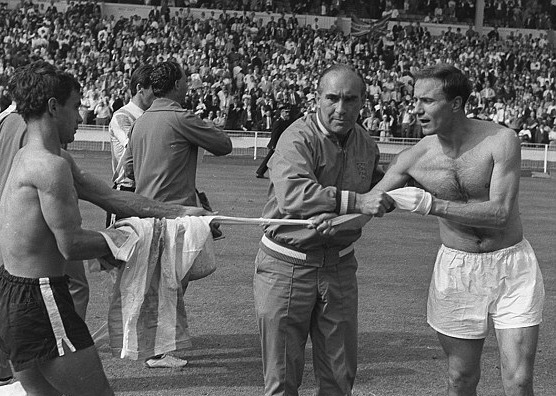 Alf Ramsey prevents shirts being swapped after England beat Argentina. If that was controversial, then Ramsey’s next public act would produce outrage in Argentina. In a TV interview he said: “We have still to produce our best and this best is not possible until we meet the right type of opposition. That is a team that comes out to play football and not act as animals.” Ramsey had not directly referred to Argentina as “animals” but he may as well have done for the angry response he got in South America and how the quote is remembered half a century later. There would be unsavoury incidents behind the scenes too; the England players reporting years later that a chair was thrown into their dressing room, smashing a glass door as tempers boiled over afterwards. At the same time as England beat Argentina, the other three quarter-finals were taking place. 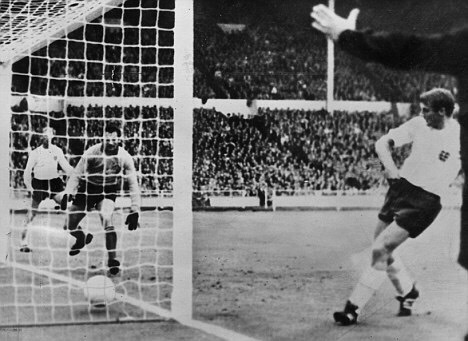 The Soviet Union and West Germany both won through, but of direct concern to England was the match at Goodison Park. North Korea sensationally led Portugal 3-0, before Eusebio inspired the Portuguese to a 5-3 victory. For the first time since 1954 a European side would win the competition. According to the fixtures issued before the tournament, England’s semi-final originally should have been played at Goodison Park but it would now be held at Wembley instead (a move some critics feel gave them an unfair advantage). English football prepared for a major night. “The feeling was that if we could stop Eusebio then England would win,” said broadcaster Barry Davies in 2006. The Mozambique-born forward had been a major star at the finals, having scored seven times in four games. It was the first time Portugal had qualified for the World Cup and they were making up for lost time by reaching the last four and looking to win the competition. England kept the line-up that beat Argentina and a much friendlier contest took place. Bobby Charlton – who along with brother Jack had been cautioned against Argentina – gave the hosts a half-time lead, before excellent work by Hurst allowed the Manchester United star to score his second on 80 minutes. But two minutes later the England defence was breached for the first time in the competition, Jack Charlton handling in the box in a bid to stop the Portuguese scoring. 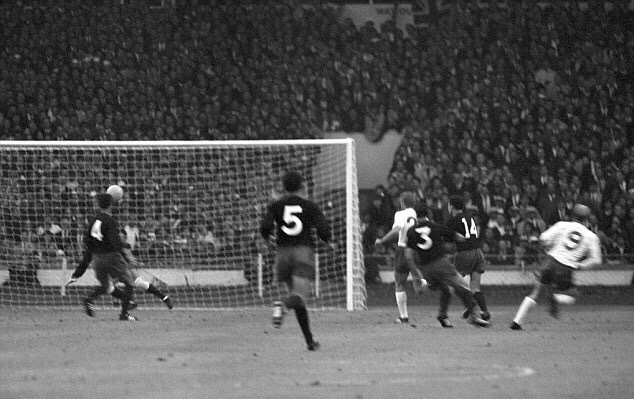 It proved a futile gesture, Eusebio stepping up to beat Banks from the spot. The English nation endured a nervous closing few minutes, before the final whistle sounded. England were in the World Cup final. England and Portugal prepare to meet in the semi-final. Eusebio left the pitch in tears, Portugal enduring the first of several near-misses before finally ending their 50 years of hut at Euro 2016. The Portuguese could take some consolation in the praise coming their way from the English press. Albert Barham wrote in The Guardian: “No finer semi-final match than that in which Portugal were defeated 2-1 could have been anticipated. No finer sporting team have had to bow out to England, at their best, in this competition. How the audience of 90,000 were held in the spell of this fine Portuguese attacking side, and of the great performance England put up against them to win. 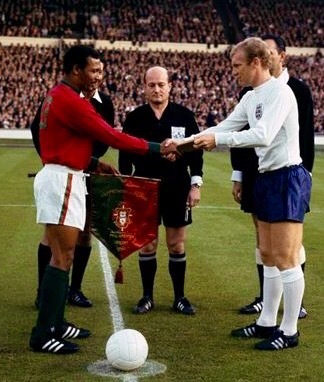 This was attacking football at its best, magnificent in every department; a triumph too, in these troublesome times, for true sportsmanship.” Two nights later Portugal beat the USSR 2-1 at Wembley in the third-place match, Eusebio scoring a penalty to take his tournament tally to nine goals.